Ever since Chinese New Year I have become obsessed with perfecting my own Chinese recipes! Usually my Dad is king of the wok but I’ve decided it’s about time I took over. You may remember, I posted recipes for Steamed Prawn Won tons and Crispy Spring rolls – two recipes which taught me about some rather exciting new ingredients (won ton and spring roll wrappers) and new techniques (such as how to fill and cook them!) I also posted a recipe for Sesame Chicken with Green Beans which is fast becoming a favourite in my house! I’ve always enjoyed cooking Oriental dishes, for years I’ve had a go to special fried rice recipe, and a lovely recipe for Asian Salmon with Cucumber and Red Onion dipping sauce, but I’m keep to keep on trying out new ideas. The idea from this recipe came from two main sources of inspiration: firstly, whenever we order Chinese in, we always get one chicken, one pork, and one beef dish (at the very least!) and as I am yet to perfect a Chinese pork recipe, pork had to be my ingredient of choice; secondly, one of my favourite Chinese flavours is that sticky yet spicy sauce that covers ribs, I’m not talking about BBQ sauce, something a bit more oriental. And so this dish was born! One of the great things about this recipe is that it can be presented in a number of ways. You can add vegetables to the stir-fry if you so choose (as you can see I did from the pictures!) You can serve it with rice, or noodles! 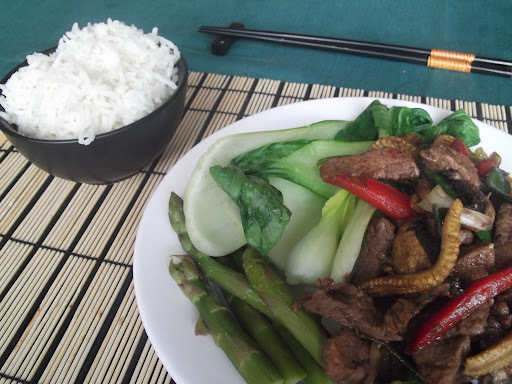 Or alternatively if you’re being really healthy, you could serve it on a bed of steamed pak choy! It really is up to you. 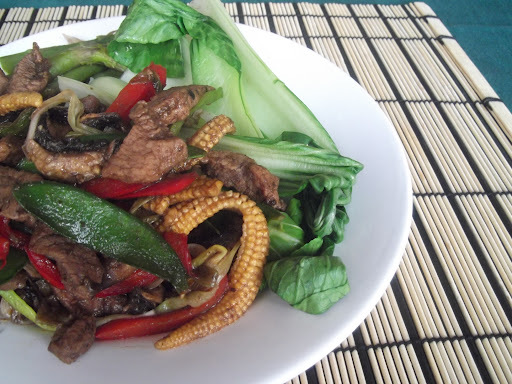 So, here is my recipe for a delicious sweet and spicy pork stir fry. Thoroughly mix together the honey, five spice, soy sauce and lemon juice. Cover the pork in the marinade and leave in the fridge for at least half an hour. Finally, stir fry the pork in some ground-nut oil and the marinade for 5mins or until the pork is cooked through!